Make way for wealth, happiness, and prosperity with celebrations of Makar Sankranti, Pongal and Magh Bihu. Today is the auspicious day when Sun will enter in Capricorn spreading its energies for abundant harvest. Read further to know more about the day. Makar Sankranti is the famous festival of Northern parts of the country like Bihar, Madhya Pradesh, Maharashtra, Manipur, and Uttar Pradesh. It is known as the harvesting festival. In the term ‘Makar Sankranti’, Makar refers to Capricorn and Sankranti refers to transit; hence, on this day, Sun transits into Capricorn. Take a look on the auspicious Muhurat of Makara Sankranti in 2015. 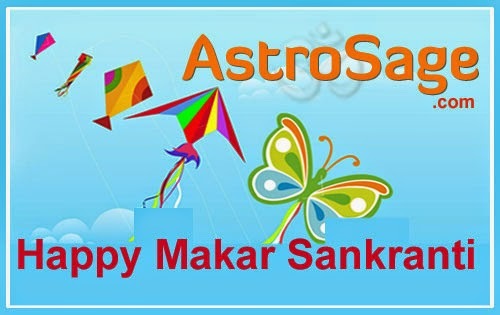 Makar Sankranti is celebrated by farmers in the joy of growing healthy and abundant crops. Winters season terminates with this festival and spring season begins. Makar Sankranti is also known as ‘holy phase of transition’, as the inauspicious period comes to an end and auspicious period begins from this day. From this day onwards, any auspicious or sacred occasion can be celebrated in a Hindu family. From the day of Makar Sankranti, Sun starts moving in northward direction (Uttarayan). On the day of Makara Sankranti, people clean their homes properly early in the morning and worship Lord Sun with flowers, coconut, holy Ganga water, turmeric powder and rice etc. After worshiping the lord, a traditional offering or Baena is carried out for mother-in-law or sister-in-law for seeking their blessings. This Thali of Baena includes sweets, money, any gift, Roli and rice. Pongal is a major harvest festival of Tamil Nadu. The term ‘Pongal’ refers to prosperity and abundance. Let’s take a look on the auspicious Muhurat of Pongal in 2015. People of Tamil Nadu thank Lord Sun for bestowing them with good harvest season. It is also called the Surya Mangalyam. There is an important tradition of boiling milk in a new clay pot with rising Sun, on this day. People prepare a special Prasad (sacred food) and offer it to the Sun. The Prasad is prepared with milk, rice, and dry fruits in a decorated clay pot under Sunlight. In some parts of Tamil Nadu, Pongal is celebrated for a period of four days. People clean their houses properly and worship Lord Indra on the first day of Pongal. Second day of Pongal is dedicated to Lord Sun. Sacred food is prepared and distributed for honoring Lord Sun. Cattles are worshiped on the third day by decorating them and offering food to them. The fourth day is believed to be the main day of the festivals when brothers are worshiped by theirsisters. Magh Bihu is another harvest festival which is celebrated in Assam. The celebrations of Magh Bihu last for a week. Magh Bihu marks the end of harvesting season. The festival of Magh Bihu is dedicated to Agni (fire). Special traditional huts ‘Meji’ are prepared from bamboo, leaves and thatch, on the night of Uruka, the last day of Paush month according to Assamese calendar. People of Assam prepare and consume traditional food in ‘Meji’, celebrate the festival for the whole night and burn them (Meji) the next morning. Games like Takeli Bhonga and buffalo fighting are another major attractions of the festival. Makar Sankranti, Pongal and Magh Bihu have great importance for the agriculture of the country. People of different regions celebrate these days, as the weather changes and they get a chance to yield different crops in fields. Worship the energy of Sun and thank the deity for showering prosperity, wealth, and happiness on you in the form of good harvest.